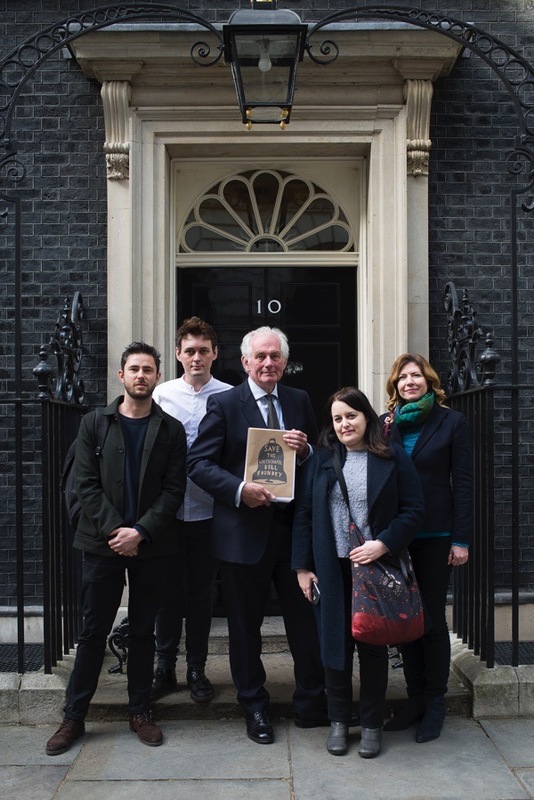 Yesterday, Dan Cruickshank and representatives of leading heritage groups delivered a petition of more than ten thousand signatures to Karen Bradley, Secretary of State for Culture and Sport, accompanied by the following letter. 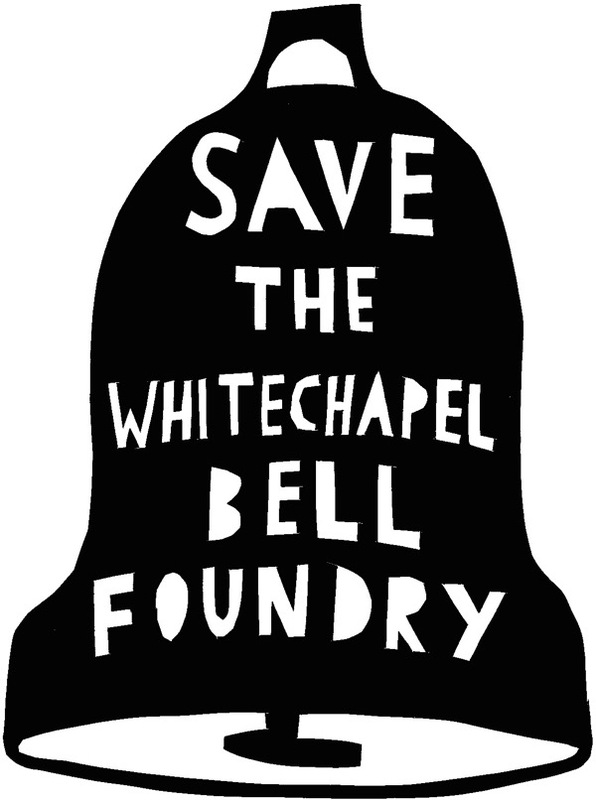 We, the undersigned national and local organisations, wish to express our deep concern about the imminent loss of the Whitechapel Bell Foundry and have also strongly registered our views with Historic England. 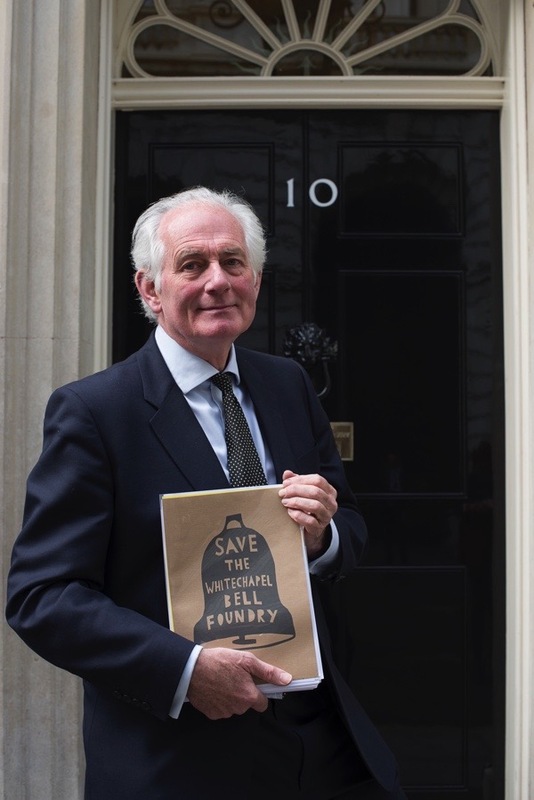 Our campaign has been supported by many high-profile individuals in the arts and cultural world including architect, writer and TV presenter George Clarke, author Charles Saumarez Smith, historian Dan Cruickshank, architect Sir Nicholas Grimshaw, sculptor Sir Antony Gormley and many more. The petition attached has been signed and supported by over 10,000 individuals in just three weeks. We also wish to highlight the exceptional historical and cultural significance of the site that has been at the heart of British bell casting for centuries. The business, principally the making of church bells, has operated continuously in Whitechapel since at least the 1570s. It has been on its present site with the existing house and office buildings since the mid 1740s. In our view this uniquely important historic asset should be properly protected and celebrated through listing at Grade I. A straightforward redevelopment of this site is not the only option. The UK Heritage Building Preservation Trust which owns and manages Middleport Pottery in Stoke, has made an open request to the owners of the buildings and business to defer the current sale. This would enable an alternative model to be assembled which would save the foundry for the nation where it has been in continuous operation for over 250 years. We, along with thousands of other people, ask you to understand our concerns and respond accordingly. Best of luck (fingers crossed). I signed this petition and hope every single “voice” is heard as loudly as every bell born in the Foundry over these many ,many years. Great letter, petition looks fantastic! Here’s hoping that this petition will be heard and achieve its aim. Excellent work by all concerned; let the City bells ring out loud and clear to save this historic foundry. Well done, good luck – let us hope someone has even a modicum of sense.. I wish the petition every success – it certainly deserves it. However, I fear there will be too much “other business” on every politician’s mind at the moment. An ideal solution would be for the site to be developed with a resident curator, in the way that Dennis Severs house is now being run. Fingers crossed for a great outcome. Thanks for the awareness, and the opportunity to be part of this worthy intervention. GA, thank you for continuing your good work of historical preservation for the Whitechapel Bell Foundry. Certainly the name of Dan CRUIKSHANK should carry some cultural heft if he is a descendant of George Cruikshank (1792-1878), the British caricaturist and friend of Dickens. When I visit London it is because of places like the Whitechapel Bell Foundry…those bits of London that are the real London. With such history (and being such a wonderfully historic building) the Bell Foundry (and other bits of vintage London) must be preserved, curated and nurtured. Sadly, we are seeing the demise of the London so many of us love, as more and more of it succumbs to the increasing rise of culture-killing commercialism. Whitechapel is an example of contrasts that reveal how much more desirable the ‘human scale’ element of the city is compared to the high-rise office blocks and impersonal glass-and-steel shop fronts that are making London look and feel like some anonymous place in America. Thanks for the hours of good reading during a long, rainy Oregon winter. So many parallels to what is going on in Spitalfields with what is going on in my historic neighborhood in Portland. Thanks for giving the “preservationists” among us a model for using our voices for local color and character. Thanks for honoring the beauty of “everyday” in time and locality. To the Bell folks, rooting for the success of your petition way across the world and hoping Gardner’s store stays open, too!